We moved into our house on October 15th.. it has taken us 2 months to get the house where I even feel like I can show it on the blog and facebook! We hosted a Christmas party for church last weekend and it was a good "push" to get us to get the work done. With a lot of work and help from Jake's parents, we spent all of Saturday getting the house cleaned, organized, and ready to go. I took pictures to document the clean house, a momentous occasion. I'll write a few posts, highlighting each room. 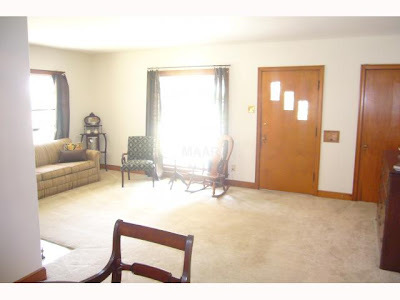 This picture was taken off the MLS listing and shows the former owner's stuff... this is how we saw it when we came with our realtor. Nothing wrong.. just not our style. The stark white was throughout the whole house. Notice the wood and how it looks awkard against the white. This is a view of the living room from the other angle - standing in the dining room looking at the front door. Jake, Sebastian, and Beamer studying on the couch with mismatched furniture sitting all around. Meanwhile, Beamer and Tyson enjoyed having the living room to themselves since no one could get to the living room through all the boxes.. Here's a close up of the fireplace. We've got it set up for Christmas (hence the stockings and garland). The painting was done by a local artist, Kristi Bauer, and given to me as a housewarming gift by my parents. The glass boxes on the ground are from World's Away and were used as centerpieces at our engagement party - they sell them as planters in their Memphis warehouse showroom. 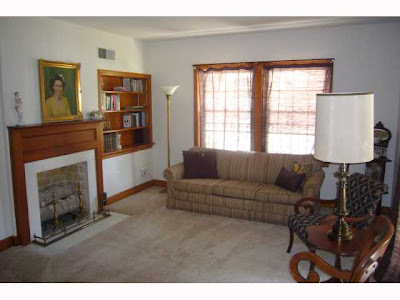 To the right of the fireplace is a built in book shelf. Previously it had four shelves that were equal and I took one out and made them different heights. I also painted the back of the book shelf the same color as the walls. Before, our stuff hid against the wood and now it stands out. I've got an assortment of pictures, bowls, plates, and such on it now. A few things of note are a gold plate that was my grandmother's from Germany and a sunflower clock you can barely see (in the bottom shelf on the left) that my friend CHB made out of salvaged metal for me. Also in this picture you can see a lamp - this lamp was in my pink and green bedroom from college and is also from World's Away (gotta love the scratch and dent warehouse sales). It was pink and green (like everything else in that room) and had a different shade. I got a drum shade from World's Away and spray painted the lamp chocolate brown. It really fits well in the room. Here's the view standing in the living room looking at the dining room. Here you can see our new slipper chairs, one of only two furniture purchases we had to make for the house. We got these Avington slipper chairs in vine for a steal at Target online (blog post here) and have really enjoyed them. And now, a view of the room as a whole. Here you can see our Christmas tree. I love that it is in our front window so you can see it from the street. And lastly, a picture of it all lit up at night - cozy, right? So does it look better than when we first came in to the room?